Rick Remender's latest book sees him re-team with collaborator Jerome Opeña (Fear Agent, Uncanny X-Force) as he delves into the realm of fantasy. It's a new playing field for a writer who spends a majority of his time building science-fiction worlds (such as in Black Science and Low), and Seven to Eternity Vol. 1: The God of Whispers, collecting the opening four issues, is a bit of a mixed bag. I find myself excited for what's to come, but dissatisfied with what's here in this volume. Right away the books biggest selling point is apparent: Opeña's art is astonishing. Matt Hollingsworth's colors both complement and enhance the stunning environments and otherworldly creatures that Opeña crafts. The gritty character designs slot right into a grim world that's become a trademark of any Remender series. What stands out in comparison to Remender's other creator-owned work, apart from the genre, is the presence of a true "Big Bad" from the beginning of the series. It suggests a very basic good-versus-evil premise, and there's little to suggest otherwise by the end of the book. On the surface, this is a book about fathers and their sons, and vice versa, and what each is willing to do for the other. We meet Garis Sulm, also known as the God of Whispers or the Mud King, who comes across as comedic, but with an undertone of malevolence. His son is his right-hand-man, and he's even more terrifying. In the same vein, the book's protagonist Adam Osidis is defensive of his own father, but a series of flashbacks explicates their troubled relationship. I expect the book to continue to develop these themes, especially how Adam explains away his father's questionable morality, but I'm not sure this is quite enough to maintain the entire series by itself. Seven to Eternity is also about man's weakness for his own desires, and how the Mud King can take advantage of that through his devil's bargain with Adam. It's something that isn't touched on frequently enough, but it's there. Overall, we're essentially audience to a tale of good and bad, by way of a convoluted uprising-and-rebellion narrative. This first volume needed a lot more time to establish its characters and the world they inhabit. There's plenty of magic and mysticism established basically from the beginning, but a lot of it is hard to keep up with. Volume one is a criminally hurried introduction into an enormous world, and structurally it's a little wobbly. The first issue itself reads as though it has three natural endings instead of one, and the final issue meanders to the finish line before it at least closes out on a reasonable cliffhanger. The climax takes place through the middle two chapters, and the action is haphazard at times. We meet an ensemble around these middle stages, and none of the newly-introduced characters are memorable. Given that they first appear in the midst of an epic battle, they're all just faces shouting words that hardly make any sense. Remender seems to abandon for a time the thread of whether Adam should join the rebellion or accept the Mud King's offer for eternal life, among other things, and this only gets picked back up again after everything settles down. Finally some essential character development takes place toward the end. Every interaction with the Mud King that Remender writes is fantastic, and a conversation between the villain and the book's hero in the final chapter is particularly stirring. Adam himself is interesting enough. It's made a point that he is ill and will die in a matter of months, which is a bold choice. It suggests that anything can happen going forward, and because of that I can't help but hope that the Mud King's offer for healing isn't as cut-and-dry as it appears. Jerome Opeña's pencils and Matt Hollingsworth's colors are worth the price of admission. This is one of the most beautiful books on the shelves right now and I have faith that, in the long run, the plot of this series will flow a little neater. 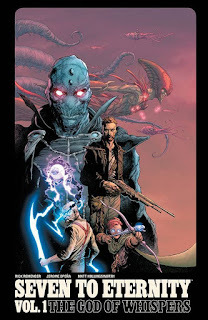 Unfortunately, Seven to Eternity Vol. 1: The God of Whispers feels sporadic and lacks the world-building required to hit the level of scope that Remender desires. 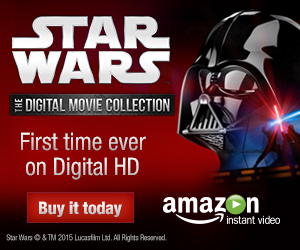 So far, it's a dressed-up tale of rebellion that's trying its hardest to pretend it's not.